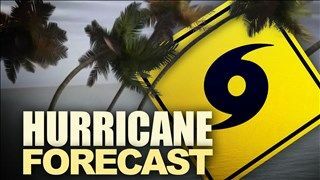 Colorado State University issues an annual forecast on the number of tropical storms and hurricanes in the Atlantic basin. (Bloomberg) -- After the costliest Atlantic hurricane season in history last year, early forecasts indicate 2018 will be above average. Seven storms could become hurricanes this year and three major systems may reach Category 3 or stronger on the five-step, Saffir-Simpson scale, according to the forecast. There’s a 63 percent chance the continental U.S. will get hit by a major hurricane, compared with the 20th Century average of 52 percent. A storm gets a name when it reaches tropical-storm strength with winds of 39 miles (63 kilometers) per hour. The six-month Atlantic season starts June 1 and enters its most active phase between late August and September. A year ago, the researchers predicted 11 named storms, with four becoming hurricanes and two major systems. Turned out there were 17 storms, 10 hurricanes and six major systems including Irma, Harvey and Maria. This year is more difficult to call because neither the Atlantic nor the Pacific is offering forecasters a lot of clues, Klotzbach said. While hurricanes thrive on hot ocean water, the eastern Atlantic is cool, and the western part of the basin is warm. Over in the Pacific, a weak La Nina is fading and the equatorial region should fall to its neutral state with no guarantee it will warm. Those warm waters along the equator in the Pacific can cause more wind shear to develop in the Atlantic that can tear apart storms. By summer, forecasters should have a better indication of how much wind shear to expect and whether the entire Atlantic is heating up, providing fuel for storms. Still, there can always be surprises. “No one could say in early August last year we were going to witness the apocalypse,” Klotzbach said.